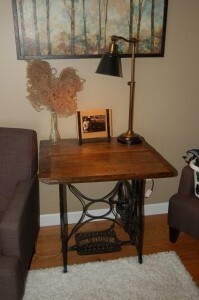 Reclaimed Wood: Add flair and your personal touch to your remodeling project (I did with reclaimed wood). Who would have thought that a Saturday morning bike ride this summer in the Illinois countryside would end up providing us with so many wonderful additions to our home! The weather was perfect and as is almost always the case, the scenery was extraordinary. The trees were full of summer life and the long grass was waving gently from the morning breeze as the sun was warming the day. My wife and I were riding our bikes side by side as we came around a corner and she pointed into the distance at an old partially demolished barn that was set back about 50 yards from the road. It had definitely looked better early in its life but time had most certainly taken its toll on the old barn. The owner of the barn, John, happen to be out near his barn working on his truck in the driveway and so my wife, one who is never afraid to approach a stranger, pulled in to introduce herself. After a couple of minutes of courtesies my wife got to the point of her mission and asked John what his intentions were for the remaining wood that he had stacked on the concrete slab of the old barn. John was quick to invite us to help ourselves to whatever it was we wanted and refused to take even one dollar for any of it. Our ride back to our car couldn’t go fast enough as we still had over 20 miles left to complete our ride but that time allowed us the opportunity to discuss all of the things we might want to do with the wood we were about to receive. After the ride was over we quickly loaded the bikes in the car and headed back to Johns house. 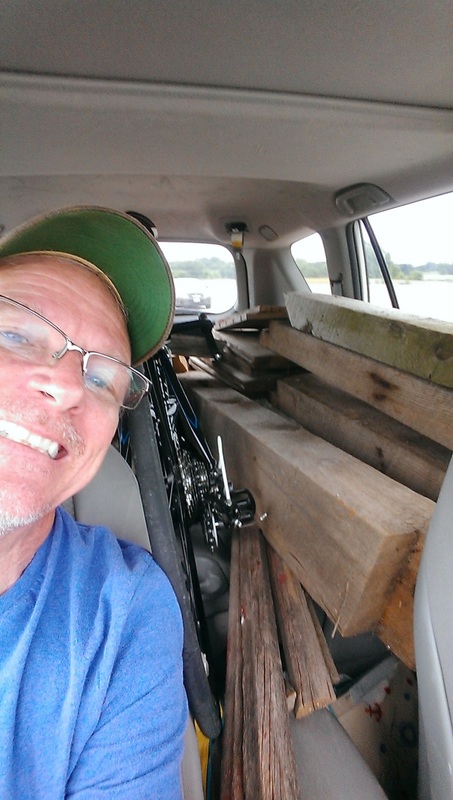 We loaded up the car as full as we could, stopped to get some more water and headed home with our new found treasures. Our first project was completed in our bedroom. It was nothing too difficult but one that did take a little time. We had to take our bed completely apart and then we took the old barn door he gave us, mounted it to some 4×4’s and fastened them to our existing bedframe. Instantly we had completely changed the look of our entire bedroom and we absolutely love it! Our second project took a little more planning, and a lot more labor but I absolutely love the way the front entrance turned out. 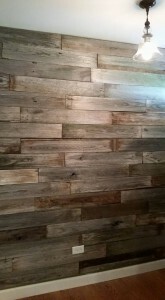 We took the tongue and groove boards that use to be the siding of the old barn and put them on the wall in the front entrance of our home. The boards look spectacular and make a great statement when people enter our home. They are so warm and inviting. We then took a few of the smaller boards that use to be the floor of the upper portion of the barn. They were tongue and groove boards that were extremely thick to hold the hundreds of hay bales that used to be stored there during the winter months long ago. We made a table top and combined it with an old sewing machine base that we picked up at a barn sale in the same area 3 weeks later. It proudly sits in our front family room and adds to the charm of the room connecting to the front entrance where the wood wall is located. We still have a lot of various pieces of barn wood sitting in our garage and we are always looking for different ways to use what we have and will continue to find creative ways to use the future wood we undoubtedly will come across in our travels. 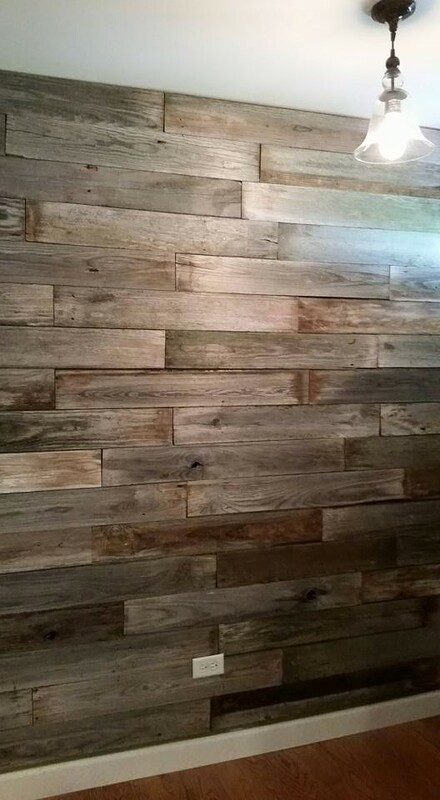 Obviously reclaimed wood isn’t for everybody but when you are doing a home remodeling project the best way to make your remodeling project your own is to make your own statement/add your own flair. 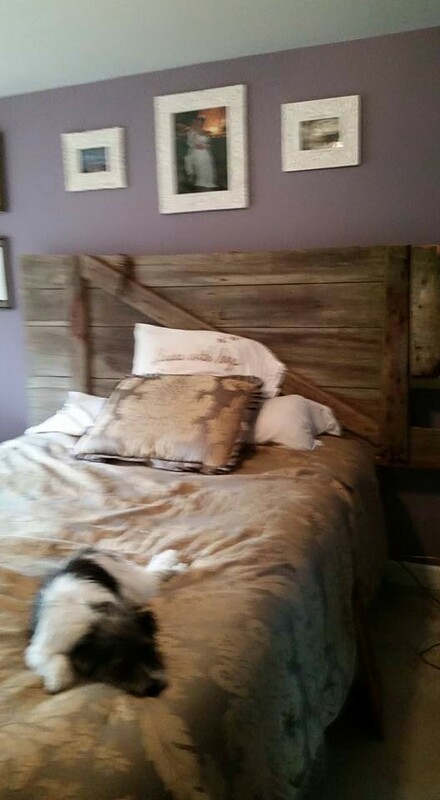 Maybe it is some reclaimed wood, an accent wall, or a piece of furniture that was handed down from a family member. No matter what it is, if it is important to you make sure to find a way to tie it in to your remodeling project. A good contractor will listen to your needs throughout the project and they will help you find a way to tie that special item in to your remodeling project. Just make sure you find a contractor who doesn’t just talk, but will listen also and have fun with it!